This topic describes how to upgrade BOSH Director for Pivotal Cloud Foundry (PCF) on Google Cloud Platform (GCP). After you complete this procedure, follow the instructions in Upgrading PAS and Other Pivotal Cloud Foundry Products. Log in to the Pivotal Network, and click on Pivotal Cloud Foundry Operations Manager. From the Releases drop-down, select the release for your upgrade. Pivotal Cloud Foundry Ops Manager YAML for GCP When you click on the download link, your browser downloads or opens the OpsManager_version_onGCP.pdf or OpsManager_version_onGCP.yml file. Copy the filepath string of the Ops Manager image based on your existing deployment location. Name: Enter a name that matches the naming convention of your existing Ops Manager image files. 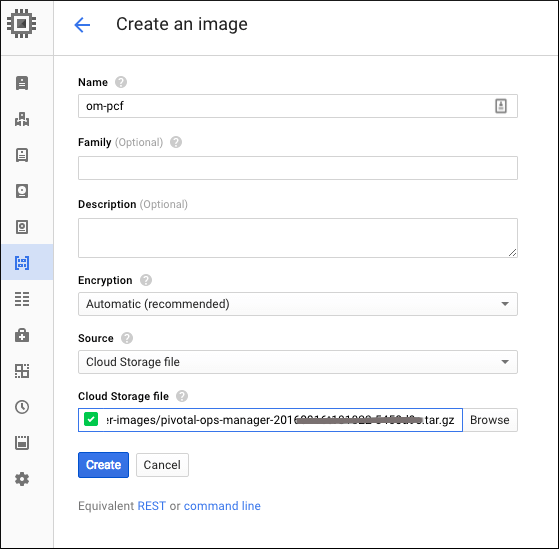 Cloud Storage file: Paste in the Google Cloud Storage filepath you copied from the PDF or YAML file in the previous step. Click Create. The file may take a few minutes to import. Name: Enter a name that matches the naming conventions of your existing deployment. Zone: Choose a zone from the region of your existing deployment. Select the Boot disk type. If you have an Ops Manager environment with high performance needs, select SSD. As an example, environments used to develop PCF tiles may benefit from a higher performing Ops Manager VM boot disk. For most environments, however, you can select Standard. Under Identity and API access, choose the Service account you created when you initially installed Pivotal Cloud Foundry. 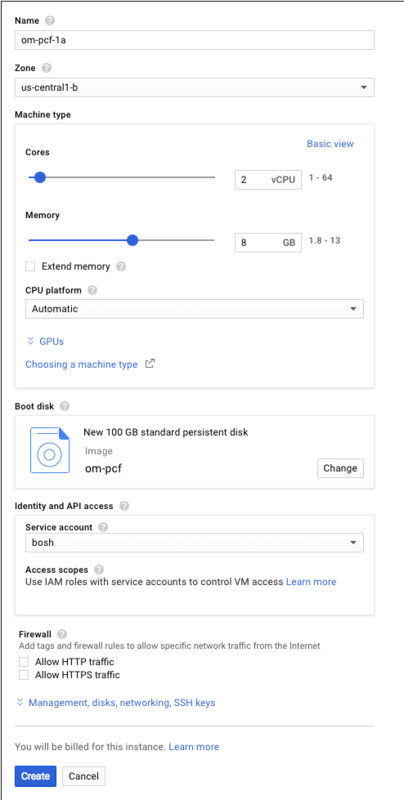 See Step 1: Set up IAM Service Accounts in Preparing to Deploy Ops Manager on GCP Manually. Allow HTTP traffic: Only select this checkbox if you selected it in your original Ops Manager VM configuration. Allow HTTPS traffic: Only select this checkbox if you selected it in your original Ops Manager VM configuration. For Network and Subnetwork, select the network and subnetwork you created when you initially deployed Pivotal Cloud Foundry. 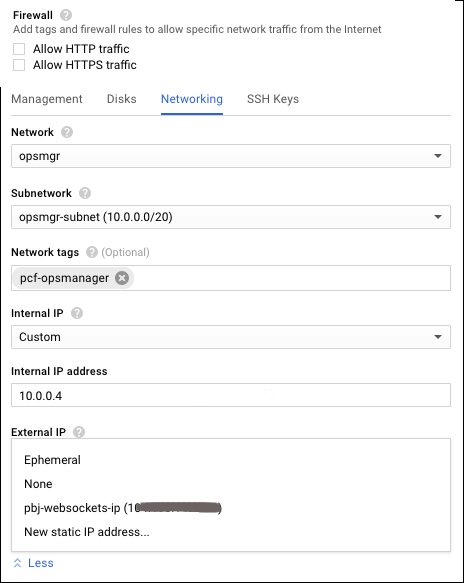 See Step 3: Create a GCP Network with Subnets in Preparing to Deploy Ops Manager on GCP Manually. For Network tags, enter any tags that you applied to your original Ops Manager. For example, if you used the pcf-opsmanager tag to apply the firewall rule you created in Step 5: Create Firewall Rules for the Network, then apply the same tag to this Ops Manager VM. For Internal IP, select Custom. In the Internal IP address field, enter a spare address located within the reserved IP range you configured in your existing BOSH Director as part of Step 5: Create Networks Page. Do not use 10.0.0.1, which is configured for the Gateway. For External IP, select New static IP address…. In the next form, enter a name for the static IP. For example, om-public-ip. Click Reserve. In the External IP drop-down, select the static IP address you just reserved. Click Create to deploy the new Ops Manager VM. This may take a few moments. Navigate to your DNS provider, and modify the entry that points a fully qualified domain name (FQDN) to the Ops Manager VM. Replace the original Ops Manager static IP address with the public IP address of the new Ops Manager VM you created in a previous step. WARNING: In order to set up Ops Manager authentication correctly, Pivotal recommends using a Fully Qualified Domain Name (FQDN) to access Ops Manager. Using an ephemeral IP address to access Ops Manager can cause authentication errors upon subsequent access. If you are importing older Ops Manager settings, you must use the FQDN. After you complete this procedure, continue the upgrade instructions in Upgrading Pivotal Cloud Foundry topic.